With so many places to eat onboard Norwegian Bliss, you'd expect there to be some winners and some losers, but while we discovered which our favorite was (Q by a long shot!) we never did encounter a bad meal. Dining in the main dining rooms was just as good as in the specialty restaurants -- and, in fact, a few our favorite meals were in the MDRs. Complimentary venues on Norwegian Bliss are limited to the three main dining rooms, which all share the same menu each day, plus the buffet and the 24/7 Local Bar & Grill. A light breakfast and lunch is also available in the Observation Lounge, and you can get quick bites at venues like Starbucks, the District Brew House and The Cellars (during dinner hours only). As on Norwegian Breakaway, Getaway and Escape, Norwegian Bliss features The Waterfront on Deck 8, offering alfresco seating for several bars and dining venues, including Los Lobos, Cagney's Steakhouse, Ocean Blue and La Cucina. For those with dietary restrictions, the main dining rooms are your safest bet, as there is much less room for flexibility in the other venues. Same is true of the specialty restaurants, but a few days' notice will give the chef time to make arrangements. Waiters are trained to ask before taking orders in every venue whether someone has a food allergy or not. The Manhattan Room (Deck 7), Taste (Deck 6) and Savor (Deck 6): Norwegian Bliss has three included-in-the-cruise-fare main dining rooms. Taste and Savor are the two smaller venues, located directly across from each other, and open for breakfast, lunch and dinner, while the Manhattan Room is a much larger space and is open only for dinner. All are stylishly decorated and have a relaxed dress code. Vegetarian, gluten-free and spicy items are marked accordingly on the lunch and dinner menus. The lunch menu doesn't vary and is available every day. Appetizer choices include, but are not limited to, roasted tomato soup, spinach Caesar salad, Cajun shrimp salad, popcorn shrimp and chicken nachos. Main meals are fish and chips, Spanish frittata, bacon-wrapped meatloaf, roasted leg of lamb and fried chicken. There's also a tuna sandwich, Philly cheesesteak, grilled Cajun grouper sandwich and classic cheeseburger. A small selection of desserts is also available. The dinner menu isn't much bigger than the lunch menu but entree choices change each night. Appetizers, many of which do repeat, might include two to three soup choices (French onion, cream of cauliflower, cheese tortellini), three salad choices (Caesar, mixed garden, grilled iceberg wedge), bruschetta, seared swordfish carpaccio and smoked mozzarella ravioli with lobster cream sauce. Classic (i.e., available everyday) entree choices are grilled New York strip steak, breaded flounder filet, herb-crusted rotisserie chicken, shrimp and mushroom Alfredo, carved whole-roasted pork loin and three-cheese baked ziti. Other main course options might include linguine with little neck clams, braised beef brisket, chicken cordon bleu, grilled lemon-pepper shrimp, eggplant parmigiana, almond-crusted red trout and a vegetable burrito. The dessert menu always features a changing selection of cakes, pies and other pastries, as well as ice cream (vanilla and chocolate), and a fruit plate or cheese and cracker plate. We particularly recommend the Kahlua creme pie and warm chocolate volcano. Garden Cafe (Deck 16): Norwegian's buffet is located high up on Deck 16 and offers both indoor and outdoor seating, the latter of which is located close to one of the ship's main pools. Seating is plentiful, though it can be difficult to find a spot during peak hours (noon to 1 p.m. on sea days, 8 to 9:30 a.m. on port days). Stations are situated throughout the space and while generally speaking they're the same on both sides, there seemed to be a few stations in the middle that only appeared once. Even after a week onboard, we found we still wandered around scoping out our options to make sure we found everything. Breakfast, lunch and dinner are available here, as are evening snacks. Breakfast is the usual a.m. fare with eggs (including omelet stations); bacon and sausage; French toast and pancakes; cereal, yogurt, oatmeal and fruit; and juice stations offering apple juice, orange juice and a cranberry cocktail juice. Water, tea and coffee are also available. Lunch serves up a wide selection of choices including burgers and hot dogs (turkey and veggie burgers are available upon request), pasta and pizza, hot favorites (fish sticks, lasagna, grilled veggies, etc. ), Indian and Asian specialties, and a salad bar. Dinner is similar to lunch, with a carving station added in (baby back pork ribs, roasted turkey, beef brisket). On any given night, you might find barbecue-braised short ribs, two-bean chili con carne, vegetable burritos, country-style turkey scaloppini and a grilled vegetable medley. Sides could include steamed vegetables, fingerling wedges with Parmesan cheese, and fried or steamed rice. Desserts at lunch and dinner include a selection of some eight hard ice cream and sherbet flavors (including sugar-free choices), cookies (chocolate chocolate chip, yum! ), pastries and cakes. There are also DIY soft ice cream machines with chocolate, vanilla and swirl. The Local Bar & Grill (Deck 7): This midship, 24/7 pub-style eatery is popular all day long. Occupying the space (both literally and culinary) that the line's signature O'Sheehans' Neighborhood Bar & Grill does on all other NCL ships, The Local is a casual place to get food all day long. Its central space, right above the atrium means you can hear all the activity, games and music that's held there throughout the day. The dining venue is divided into two sections; the one nearest the bar has high tops for four and six people, while across the corridor are standard tables, as well as comfy booths for up to four people. The menu is much the same with standard pub dishes for lunch and dinner. Appetizers include hot buttered, baked pretzels, a half-dozen chicken wings (buffalo, smoked barbecue and sweet Korean chili barbecue sauces), and turkey and white bean chili, among others. There are several burger and hot dog options and sandwiches are grilled cheese, a Reuben and the Rachel (turkey breast on cranberry sourdough bread with apple coleslaw and Swiss cheese). There's also fish and chips, turkey potpie, baked ziti and a tortilla bowl. There are only three dessert options (carrot and walnut cake, apple pie a la mode, and raspberry swirl cheesecake). Breakfast is also served here, a fact many people forget making it a quiet place for a sit-down meal. On the menu, you'll find an express option, which includes scrambled eggs, bacon, hash browns and assorted pastries; a country platter with fried or scrambled eggs, bacon, sausage links, baked beans, sauteed mushrooms and hash browns; homemade corned beef hash; made-to-order omelet, French toast and hot oatmeal. The Observation Lounge (Deck 15): For a lighter breakfast or lunch, head to The Observation Lounge where you'll find several identical food stations. Breakfast selections include a variety of cereal, yogurt, fruit and pastries. For lunch, there's a DIY salad bar, a selection of premade salads, a few finger sandwich choices, deli meats and cheeses and three or four desserts. At breakfast, you'll find all the standards, but at lunch and dinner you'll find more choices for both appetizers and entrees. There is no always available section of The Haven Restaurant menu, but as long as the ingredients are available, the chef can be quite accommodating. Appetizers at lunch might include a Santa Fe flatbread with ham, tomatoes and mozzarella; a seafood fritto misto with calamari, mussels, shrimp, scallops and sea bass; lobster bisque; or nicoise salad. Lunchtime main courses might feature linguine with clams, seared scallops, herbed chicken, double-cut pork chop or a goat cheese tart. There's no slacking on dessert at lunchtime either; choices might include warm chocolate espresso brownies, carrot cake and banana cream tartlet. At dinner, appetizers might include shrimp cocktail, ahi tuna poke, beef tartare, slow-roasted pork belly, shrimp porcini risotto and butternut squash soup. At least three salads are also available each night. Dinner entrees at The Haven Restaurant could include grilled sea bass, surf and turf, seared duck breast, herbed chicken and roasted prime rib. Desserts are beautifully presented and delicious and might include rich triple chocolate cake, mocha mousse, warm pear and ginger crumble, and a strawberry and basil parfait. Texas Smokehouse Q (Deck 6); a la carte: Familiarly referred to as "Q," this new-to-Norwegian eatery offers Texas-style barbecue in a down-home setting featuring wooden tables and chairs, wagon-wheel-style lighting fixtures and wait staff wearing lariat boleros. The a la carte menu is sizable -- come with a big appetite because you're going to leave stuffed! Starters (called Texas Teasers) include Tex-Mex style tortilla soup ($3.99), deviled eggs ($2.99), Q's chopped salad ($6.99) and fried green tomatoes ($3.99), among many others. The most popular main course is the Pit Master Platter ($24.99), which features a quarter pound each of brisket, pork spareribs, jalapeno and cheese, sausage and smoked chicken, all served with coleslaw, chunky potato salad, beans and jalapeno-cheese cornbread. Can't handle that much meat all together? Each is available as a separate entree, along with beef short ribs, pulled pork, turkey breast and broiled citrus-honey salmon. All are served with the same sides as the platter. Main course entrees run from $11.99 to $17.99. As if all this wasn't enough, there are lots of sides to choose from. Our favorite, hands-down, was the sweet potato smothered in pecan honey butter and cinnamon. Other baked potato options are available, as are baked beans, wavy fries, corn on the cob and mac 'n' cheese ($1.99 to $3.99). It's hard to imagine anyone could have room for dessert after all that food, but for those that do, there are six options (each $4.50): banana pudding, peach cobbler a la mode, pecan pie, sweet potato pie, bread pudding and a massive warm chocolate brownie a la mode. Q is only open for dinner. Teppanyaki (Deck 6); $29.95: Another of the line's signature restaurants, Teppanyaki is the place for Japanese hibachi meals cooked in front of you by chef's performing tricks with the food and their cooking utensils. The meal includes a starter of miso soup and a small salad, an entree of chicken or vegetable yakiudon, seafood (shrimp, scallops, calamari), filet mignon, and vegetable teriyaki or a combo such as chicken and shrimp, filet mignon and shrimp, or chicken and filet mignon. For dessert, you can choose from green tea cake or fresh fruit sashimi. Come hungry and prepared for lots of banging (of utensils) and shouting from your fellow diners. Reservations are critical as there are just nine or 10 seats around the 11 grills and they fill up fast. Los Lobos (Deck 8); a la carte: This dinner-only upscale Mexican restaurant, which first debuted in 2016 on Norwegian Dawn, shows hints of its Mexican cantina-heritage with colorful serape-style carpeting. The menu features a large selection of plates to share, appetizers, salads, tacos, enchiladas, and house specials. Among the highlights are fresh guacamole prepared tableside (a hit with diners), stuffed poblano peppers, enchiladas de mole and aguachile de camarones (Mexican-style shrimp ceviche). There are five dessert choices, including fried beignets, tres leches cake, chocolate flan and homemade ice creams. There are also handcrafted margaritas on offer featuring the private-label Patron Barrel Select, Norwegian's own tequila blend. Prices for food range from $2.99 for a tortilla soup to $17 for a carne asada (grilled skirt steak). On warm nights, consider asking for a seat outside on The Waterfront when you make your reservation. Cagney's Steakhouse (Deck 8); a la carte: Cagney's is Norwegian's signature fine dining steakhouse; one of a few spots onboard for a fancy special event dinner -- though it actually doesn't have the strictest dress code (you'll find that in Le Bistro and Ocean Blue). Here you'll find several steak cuts ($16 to $22) along with lamb, veal and pork chops; surf and turf; grilled yellowfin tuna steak, grilled salmon, jumbo shrimp skewers and a fried fisherman's platter ($16 to $29). Starters ($3 to $8) include lump crabcake, slow-roasted pork belly, oysters Rockefeller, ahi tuna tartare, lobster bisque and cheese and vegetable marmite, among other choices. Nine sides ($3 each) are available, but we recommend the truffle mashed potatoes or Parmesan truffle fries and the creamed corn. For dessert, indulge in a creme brule, seven-layer cake, decadent chocolate brownie, caramel-butterscotch cheesecake or warm apple cardamom crisp; all are $5 each. There is a small outdoor section of Cagney's on The Waterfront. Like all the other restaurants on Deck 8, Ocean Blue has outdoor seating on The Waterfront. It's also one of two dining venues with an actual dress code: here long pants, collared shirts and closed shoes are required. La Cucina (Deck 8); a la carte: Another of Norwegian Cruise Line's signature restaurants, La Cucina offers Italian fare both indoors and outdoors on The Waterfront. The menu features all your Italian favorites but we'd highlight the burrata caprese or calamari fritti for an appetizer (there is also soup and salad if you want something lighter); ricotta tortellini, shrimp ravioli with lobster sauce and wild mushroom risotto if you're in the mood for pasta; and grilled salmon, red snapper with mixed shellfish, veal scaloppini and braised veal shank if you're craving meat. You can also get one of four styles of 12-inch pizza. Limited gluten-free menu items are available. If tiramisu isn't your dessert of choice, you can also opt for panna cotta, cannoli, a ricotta cheesecake or chocolate tartlet. Food Republic (Deck 8); a la carte: The result of a partnership with The Pubbelly Restaurant Group, this lunch and dinner venue made its debut on Norwegian Escape and was a big hit, serving up tapas-sized dishes from across the world, with an emphasis on Asian cuisine. The menu is divided into seven sections: sushi (11 different rolls); hand helds (tempura fried shishito peppers, bulgogi pani puri, tuna pizza); grill republic (pork belly kushiyaki, black cod skewers, squid); sharing is caring (avocado raita, street fries, Korean fried chicken); noodles, rice and soups (shrimp pad Thai, kimchi fried rice, yaki soba); dumplings (pork belly, duck, pastrami); and sugar pump (baklava, carrot halva, pineapple flan). Prices range from $2.99 to $12.99. Unlike at other dining venues on Bliss, diners at Food Republic select their menu choices using tableside tablets. 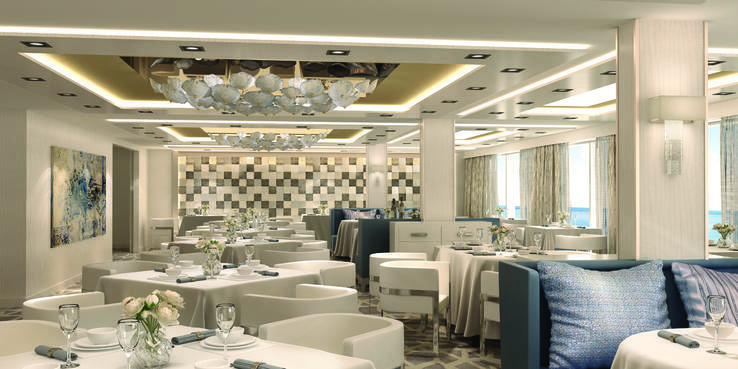 Le Bistro (Deck 17); a la carte: Norwegian's popular, fine dining French bistro is located all the way up on Deck 17 on Norwegian Bliss, giving diners beautiful views of the surrounding area. (We suspect it's especially spectacular when sailing in Alaska.) The menu at Le Bistro is divided into appetizers, soups and salads; and entrees. Starters include baked onion soup dripping with Gruyere cheese, lobster and crayfish soup, and warm asparagus salad, though the most popular appetizers are the escargots and foie gras. For your main course, choose from 11 choices including sauteed sole fillets, pan-seared jumbo bay scallops, veal medallions, roast lamb rack and coq au vin. The vegetarian entree is portobello mushrooms layered with goat cheese. Everything is quite rich, so try not to overdo it. If you've got room left after your meal, dessert options include creme brulee, napoleon, chocolate fondue for two, a cheese platter and profiteroles. Prices range from $3.99 to $19.99, with desserts running $3.99 to $8.99. Le Bistro is one of two dining venues with an actual dress code: here long pants, collared shirts and closed shoes are required. Jimmy Buffett's Margaritaville at Sea (Deck 17); $14.95: Nestled into a corner of Deck 17 toward the back of the ship and underneath the entrance to the go-karts, you'll find Norwegian's second outpost of Jimmy Buffet's Margaritaville at Sea. Just watch out for joggers as the jogging track is directly in front of the entrance to the eatery. (Even though technically the jogging track is only open before 9 a.m. and after 6 p.m. people do use it during the day.) The decor at Margaritaville is, as you'd expect, beachy and casual, with surfboards and nautically themed booths. It's here that you'll find the famed Cheeseburger in Paradise, along with several other burger varieties, grilled chicken sandwich or quesadilla, fish and chips or fish tacos, salads and snacks like nachos, conch fritters, and chips with queso and salsa. For dessert, choose from Key lime pie and cheesecake. And, of course, don't forget the beer and margaritas (which are not included in the cover charge). Margaritaville is only open for lunch. Coco's (Deck 6); a la carte: If you've got even the slightest bit of a sweet tooth, you won't want to miss this dessert spot located in the heart of 678 Ocean Place. The decadent offerings include 12 varieties of bonbons ($1.50 each) and eight tarts or cakes ($3.50 each) and six flavors of gelato ($2.50 per scoop in a waffle cone or cup) and massive milk shakes ($14.99) in a variety of flavors served in a large beer stein and featuring all kinds of toppings. We never had the courage to try one but the cookies 'n' cream one was pretty tempting with dark chocolate gelato, Oreo cookies, crushed M&Ms, caramel butterscotch, whipped cream and jelly gummy bears. Loaded ice cream sundaes are $8.99; examples include the mocha tiramisu with vanilla gelato, lady fingers, espresso coffee syrup, mascarpone cream and whipped cream and the white chocolate tutti frutti, with white chocolate gelato, fresh fruit, candied ginger and whipped cream. Four varieties of freshly made crepes ($4.99 to $5.99) are also on the menu (chocolate, dulce de leche, suzette, and lemon cheesecake). There's also a small selection of fancy coffees and teas. If you're looking to celebrate a birthday in style and want to share with others, the Celebration Platter ($18.99) serves about four and is stuffed with white, milk and dark chocolate gelato, chocolate, caramel and butterscotch sauces, assorted fresh fruits and candies. The Bake Shop and Dolce Gelato (Deck 8); a la carte: As if there weren't enough sugary delicacies at Coco's, cruisers can also hit The Bake Shop or Dolce Gelato for their sweet tooth fix. The Bake Shop takes up the inside space of this venue and serves up bonbons ($1.50 each), nine flavors of cupcakes ($1.59 for a small, $2.50 for large) and 10 flavors of macaroons ($2 each). Outside, you'll find some six flavors of gelato at $2.50 for a scoop in a cup and $2.75 for a scoop in a cone. Starbucks (Deck 6); a la carte: For those who need a larger selection of fancy coffees and teas than what they'll find at Coco's, the line's first-ever Starbucks outpost offers the coffee company's full range of beverages and pastries, with lots of dedicated seating. The District Brew House (Deck 8); a la carte: Primarily a place to grab a brew, the District Brew House does offer a few snacks to go with all the suds. Choices include crispy salmon ($4), chorizo scotch egg ($4.99), salmon tandoori naan ($6.99) and firecracker shrimp ($6.99). Room Service: All room service orders carry a $7.95 convenience charge, regardless of what's ordered or how much. Continental breakfast is available from 6:30 to 10 a.m. and includes a selection of fruit, yogurt, cold cereal, freshly baked breads and pastries, various jams and jellies, and juices. You can also order a ham and cheddar, or spinach and tomato omelet, as well as French toast. Unlike on many other cruise ships, breakfast can be ordered on disembarkation day; service runs until 9 a.m. The all-day menu features soups, salads, fruit and cheese plates, sandwiches, pizza and entrees (spaghetti Bolognese, roasted chicken, skirt steak, etc.) There are also three desserts available: New York cheesecake, strawberry pound cake and chocolate cake. An all-day kids menu offers up chicken fingers, grilled cheese sandwich, peanut butter and jelly sandwich and macaroni and cheese.